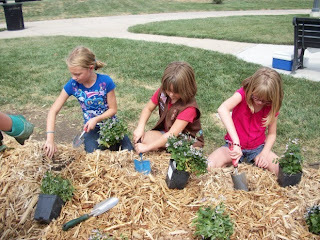 Nebraska's Beatrice Daily Sun reports that Girl Scouts recently planted a rain garden at the Carnegie building. The project was made possible thanks to a UPS Foundation award. The UPS and Keep America Beautiful Community Improvement Grant was for $5,000, w hich was used to plant the garden on the north side of the building that houses the Beatrice Area Chamber of Commerce, Gage County Tourism and Gage Area Growth Enterprise (NGage). This is the first rain garden planted on public property in Beatrice. The Rain Garden will help to solve a water drain problem for the 108 year old historic Carnegie building and will serve as an outdoor educational center for others wishing to establish their own rain garden in the community. On September 12, 12 girls and two adults from Girl Scout Spirit of Nebraska Troop 20054 and Troop 20018 learned about the benefits of rain gardens and helped finish planting the native plants in the rain. This is the fifth annual UPS/Keep America Beautiful community improvement grant program, which provides support for recycling, beautification, community greening, litter prevention and waste reduction initiatives across the country. This year’s grant awards exceeded $150,000 for 66 total projects. “We are thrilled to be one of 66 projects chosen nationwide,” said Linda Grell, executive director of Keep Beatrice Beautiful. “There are over 550 Keep America Beautiful affiliates nationwide, so this award is truly an honor to receive." Rain gardens are effective in removing up to 90 percent of nutrients and chemicals and up to 80 percent of sediments from the rainwater runoff. As a part of the 100th Anniversary Take Action Project Girl Scouts Forever Green, Girl Scouts are building rain gardens, which are planted depressions filled with native plants that capture and absorb storm water and serve as functional gardens.